Bristol Ensemble’s ‘Notes for Women’ concert at St George’s on 28 April begins with two ‘Responsories’ (anthems intended to be sung after a lesson) by Hildegard of Bingen. Click here for concert details. Hildegard was born in 1098 near Bingen, a town on the river Rhine in the west of Germany. It was customary to promise the tenth child of a noble family to the Church, so at age 14, Hildegard was sent to a nearby Benedictine monastery. She spent the next 24 years living in a small stone cell, spending her time studying, praying, and corresponding with people who approached her about the prophecies for which she became increasingly famous (she had experienced visions from the age of five). During her life she was consulted by popes, emperors, and other secular and religious leaders, and became involved in several political and diplomatic issues. Her friendship with the influential monk Bernard de Clairveaux even led to Hildegard becoming the officially recognised prophetess of the Crusades. In 1136 Hildegard was elected leader of the community of women at the monastery, and in about 1150, she broke away to establish her own convent at Rupertsburg near Bingen. She later founded a second convent at nearby Eibingen, which still exists today (although the present building dates from 1904). As well as her spiritual work, and the continuing prophecies, Hildegard was a prolific writer. She wrote three large volumes about her visions. She was a poet. She wrote the first morality play. She wrote long and detailed theological books on medicine and natural healing, as well as her own life story. And she wrote one of the largest bodies of letters (almost 400) to survive from the Middle Ages. In her 60s and 70s she travelled throughout Germany on public preaching tours, denouncing corruption and calling for clerical reform – and of course she wrote down those sermons. Hildegard was clearly very influential during her remarkably long life of 81 years. Within fifty years of her death there were proposals to make her a Saint, although this took another century to be achieved. Saint Hildegard’s feast day is 17 September – the date on which she died in 1179. 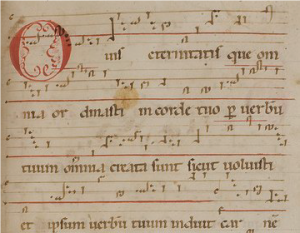 Hildegard wrote music for the nuns to sing to accompany her own poems and religious texts, and seems to have started composing in the 1140s after she became the leader of the convent. The surviving manuscripts include 77 songs forming a liturgical cycle for the church year, as well as the musical morality play Ordo Virtutum [Play of the Virtues]. There is no evidence that any of her works were performed beyond the confines of the convent during her lifetime, and the music fell into obscurity. It was not until the 800th anniversary of her death that interest started to grow, when Philip Pickett and his New London Consort gave the first British performances of four of Hildegard’s songs. Four years later, in 1983, Emma Kirkby and Gothic Voices issued a recording of Hildegard’s music ‘A Feather on the Breath of God’, which became an unexpected bestseller and propelled this music to the admiration and popularity it enjoys today. In our concert, the Royal Holloway Choir will be performing O Vis Aeternitatis [O power within eternity] and Ave Maria, O Auctrix Vite [Hail Mary, O authoress of life], which are settings of texts addressed to God and to the Virgin Mary respectively. The original manuscripts of Hildegard’s music are notated using German ‘neumes’. Like modern notation, these use a five-line staff, but rather than indicating every note individually, each neume is shorthand for a particular pattern of notes (both pitches and durations). Whilst this takes a bit of work for modern performers to decipher, it was an effective system for writing down a long line of music in a compact form. Hildegard’s music is not, as you might expect, drawn from the plainchant tradition, and in fact is highly individual. Her lack of formal musical training results in free, almost improvisatory melodies, which abound in lush and colourful images of nature. She tends to use a small number of melodic patterns, constantly reusing them in different ways, sometimes with extravagantly complex decoration. The music, of course, is inseparable from the texts, which are often visionary, meditative, or dealing with complex theological issues. Whether you see Hildegard as a radical mystic, a pioneering feminist, or a ‘New Age’ icon, there is no denying that she was an extraordinary human being. Her fresh and wonderfully evocative music resonates with us as strongly today as it did almost 900 years ago, and deserves its place among the very best.